In a cocktail shaker with ice combine the rum, bitters, tangerine juice, apple cider juice, and dash of cinnamon. Shake until well chilled and strain into two cocktail glasses. If you don’t have a cocktail shaker you can stir over ice and strain. 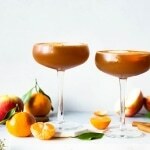 Top up cocktails with sparkling hard apple cider, garnish with tangerine slices, apple slices, or cinnamon and serve! Leave out the rum and instead combine 2 oz of tangerine juice, 4 oz of fresh apple cider juice, bitters and cinnamon in a cocktail shaker, or stir over ice and strain. Top with a non-alcoholic sparkling apple cider and serve!